These Apple Bacon Bites are a little bit sweet, a little bit savory & a whole lotta good! Make extra as they’ll be the hit of your next appetizer spread. And I’m not just talking about the holidays, friends. November and December mark the beginning of another lesser known season – Opal® apple season. And these Apple Bacon Bites are the best way to celebrate! Never heard of Opal apples? Neither had the cashier when I was checking out at the grocery store a few weeks ago. But you’ll definitely want to tune in to this season as Opals not only make excellent eating apples (think crunchy and sweet), but they also have this awesome characteristic that cannot be overstated: they don’t turn brown after you cut them. How is that for life changing? Typically raw apples will brown within a few minutes to an hour of being cut. Not so with Opals. And that non-browning characteristic makes them the perfect topping for these Apple Bacon Bites. This easy warm appetizer seamlessly combines the flavors of tangy goat cheese, savory caramelized onions, salty bacon and sweet apples – what’s not to love here? Tip: Don’t have Opal apples where you live? No problem. Chop up your favorite apple in its place and simply toss with a little bit of lemon juice before topping the phyllo cups. But do try to search out Opals if you can. It’s definitely worth the trip. P.S. Need a quick tutorial on how to caramelize onions? We got ya. In a small bowl mix goat cheese and milk together until creamy and smooth. Season with salt and pepper. Place cheese mixture in a plastic bag and snip the edge of the corner. 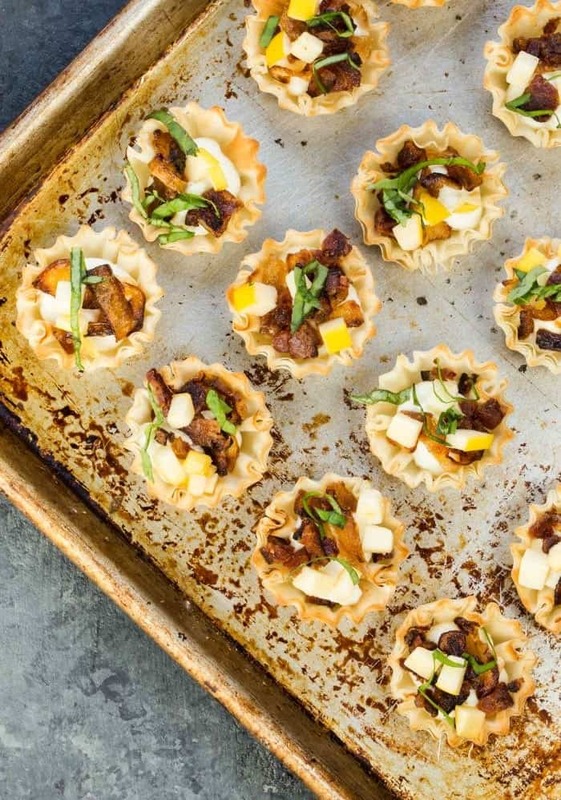 Squeeze 1 teaspoon goat cheese mixture into each phyllo cup. Place 1 teaspoon caramelized onions on top of cheese mixture. Sprinkle with bacon. Bake for 7-10 minutes or until cups are golden brown. Remove from oven and place 1 teaspoon of diced Opal Apple on top. Sprinkle with basil and serve. a whole lot of good is right!! I love all the flavors in one perfect little portion!! Portion control is key for me this time of year! These look delicious. Perfect for a holiday appetizer! And they come together quickly, too. Double bonus! Me, too, Heather! It’s always a winner in my book. I love the combo of apples and bacon! And Opals are my favorite…I stocked up at Lund’s yesterday! Bacon, apples and caramelized onions? Sign me up! I’ll make ’em for you any time, Lauren! My husband just commented yesterday how I’ve been listening to the same Christmas music for weeks, so yes, I do! I’ve not every had an Opal apple. I need to check them out. You must, Beth. I just know you’ll love Opals! 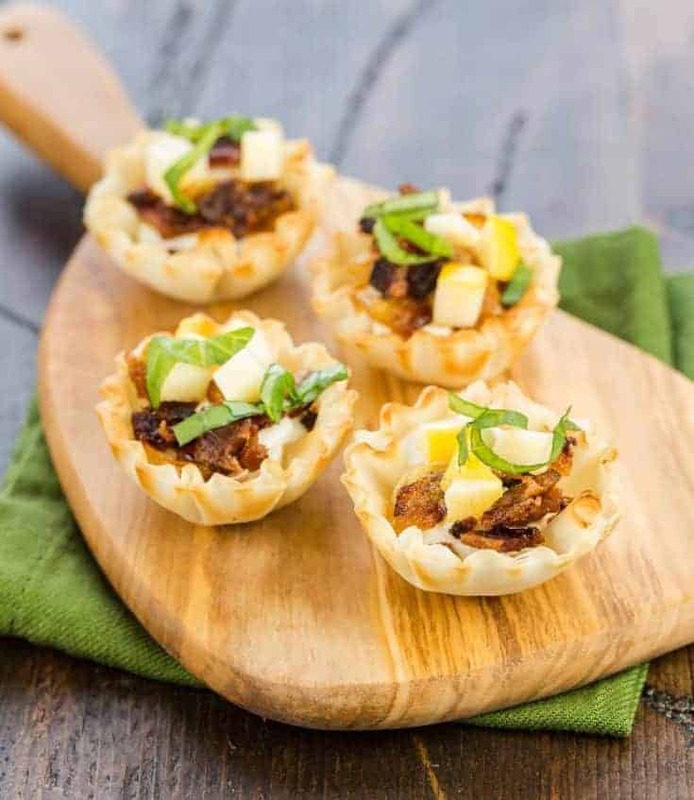 I have the radio station that plays Christmas music 24/7 for the month of december on all the time. . love Christmas music in the house. . and these apple bacon phyllo cups are just the kind of bite sized apps I love! and I need to find opal apples! can’t believe they don’t brown when you cut them!!! We should get together and bake and listen to Christmas music all day long, Alice!